1850 comp. 2 pcs of stamp. issue I with paper creases, 1x 6 Kreuzer fold folder, 1x 15C 1,5mm crease over whole stamp. 1854 comp. 10 pcs of stamp. 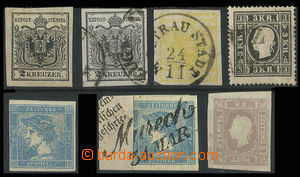 and 5 pcs of cut-squares values 6 Kreuzer issue I, from that 4x HP other MP type III, interesting CDS as Brixen, Gratz, Pesth, Linz, Tarvis, Marburg etc..
1850 collection of 7pcs of I.issue with different margines, on 3, 6, 9Kr + 15C. Nice cancelations. 1850 comp. 8 pcs of stamp. issue I, 3x with machine offset , 1x strong incl. plate variety. Supplemented with 5 pcs stamp. with bad print. Nice postmark. 1859 issue II, comp. 2 pcs of stamp. 5 Kreuzer and 1 pcs 15 Kreuzer - marginal prints. Mi.13, 15 type II. Z from-that/of-it/ 1x cut square CDS Agram. 1859 issue II, comp. 4 pcs of stamp. The 2nd issue., 1x 5 Kreuzer přednostně cancelled private commercial postmark + 3x 15 Kreuzer with blue CDS Einsiedl, Gratwen. 1859 comp. 3 pcs of cut-squares and 7 pcs of stamp. 5 Kreuzer issue II, Mi.13 type II. Nice postmark as: red Registered, Wien, blue Semily, and Pilgram, line Spital etc..
1859 issue II, comp. 6 pcs of cut-squares and 1 stamp. with flaw print - color places on/for head (Farbigen Stellen des Kopfes). Interesting postmarks Feldkirch, Blansko, Aspang etc.. Nice. 1859 The 2nd issue., comp. 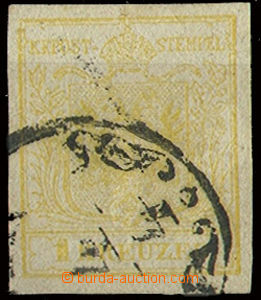 of stamps with plate variety (Plattenfehler) values 5 Kreuzer, 15 Kreuzer 2x and 15 Soldi 4x. Nice. 1859 issue II comp. of stamps 10Kr and 15 Kreuzer with plastickým print hřebíku plate (Nagelkopfprägung) + on/for 15 Kreuzer stamp. plate variety "rty". Very nice postmark Steyr. 1870 - 87 comp. 10 pcs of reprints (ND) The 2nd issue., values 2 Kreuzer 3x, 3 Kreuzer black, 2 Soldi 2x, 3 Soldi green, 5 Soldi and 10 Soldi. Supplemented with novotiskem newspaper stamp. 1,05 Kreuzer violet. Several stamp. with yellowy margin teeth. 1860 selection of 18 pcs of stamp. 5 Kreuzer, Mi.20. Z from-that/of-it/ 4x cut square. 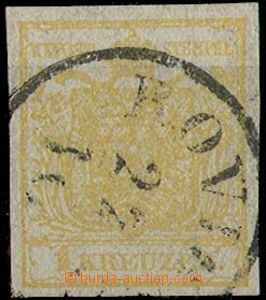 Various interesting postmarks as Kreibitz, Budin, Brandeis, Plass etc..
1860 issue III, comp. 4 pcs of stamp. values 5 and 15 Kreuzer with omitted perf holes (2 - 4 teeth). 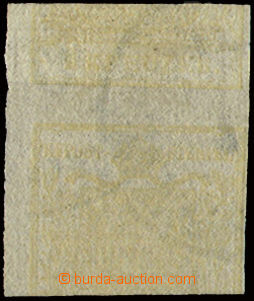 1860 issue III, comp. 6 pcs of stamp., 3x machine offset values 10 and 15 Kreuzer. 3x strong paper values 5 and 15 Kreuzer. Nice postmark Chlumetz, Leibnitz, Hořic. 1884 - 87 selection of 16 pcs of reprints stamp. issue III, 6x Kreuzer, 9x Soldi. Several pcs with yellowy teeth. 1863 comp. 11 pcs of cut-squares and 5 pcs stamp. 5 Kreuzer IV. issue, Mi.26. Nice postmark as: Peggau, Fibiswald, Marburg, 2x blue, 1x red.